There have been more than enough studies on habits to show the tremendous effect they can have on how we live our life. Experts have found that habits can dictate our entire life – and this means that if you can get into the rhythm of performing a certain task, you can make it become natural for the long-term. When it comes to skincare, this can be invaluable. After all, we all have our hygiene routines, but if you can tinker with yours to take into account some of the best advice you will be amazed at the effects it can have on your skin. Of course, this doesn’t stretch to natural imperfections. For this, you will need to turn to a rhinoplasty doctor. However, for the smaller issues, help is at hand. Let’s now take a look at some of the key habits that can help you along your way. It sounds simple, but you might be surprised at the number of women who decide to skip this first habit. Sure, most of us know that moisturizing is key, but at the same time we’re not overly bothered if we miss the odd day or so. Well, such a mentality needs to change. The best suggestion is to moisturize immediately after showering, and right before you go to bed. This preps your skin for the day ahead, as well as helping it recover now that your day has concluded. This could be one of the hardest habits to change that we cover, for the simple reason that you have probably been touching your face since the day you were born. It’s something that children do frequently and as we grow older, and we become even more conscious about our own imperfections, we tend to do it even more often. Unfortunately, it isn’t doing your skin any favors in the slightest. This is something that can transfer all sorts of things to the surface of your skin, including bacteria, and before you know it a breakout will have occurred. There are even suggestions that you are more likely to succumb to the flu if you touch your face a lot. Next on the list is all about the number of products that you apply to your face. 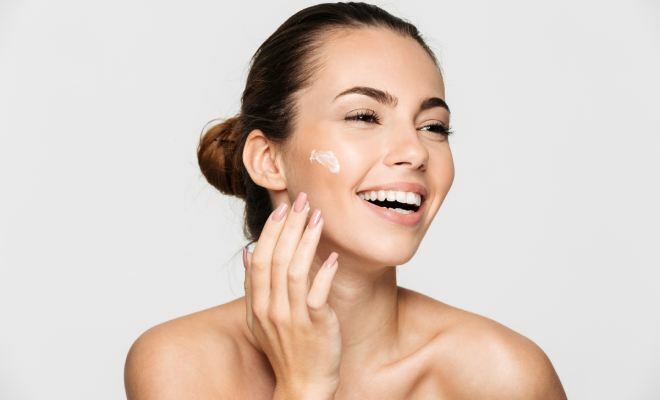 Considering the fact that the media are so quick to showcase beauty, and all of the so-called breakthrough products that can help you, this is quite difficult to do in the modern-day world. However, you have to persist. If you apply too many products to your face, you will soon find that they are all competing with each other, and the end result is simply too harsh for your face. This final habit might raise a few eyebrows, but give us time. One common habit amongst women with flawless skin is that they are always turning to sunscreen. This isn’t just on those occasions where the sun is at its peak, but it’s also when the weather is at its very worst. That’s right, even if there is a snowstorm, make sure you apply sunscreen. Each day prompts at least some UV to our skin, and this is causing bit-by-bit damage. As soon as your skin is armed with sunscreen this stops, and you will experience the effects almost immediately.